During the Great Depression, young radicals centered in New York City developed a vision of and for America, molded by their understanding of recent historical events, in particular the Great War and the global economic collapse, as well as by the events unfolding both at home and abroad. They worked to make their vision of a free, equal, democratic society based on peaceful coexistence a reality. Their attempts were ultimately unsuccessful but their voices were heard on a number of important issues, including free speech, racial justice, and peace. 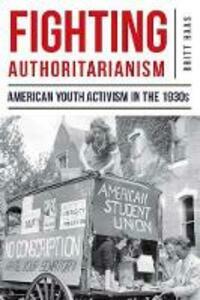 A major contribution to the historiography of the era of the Great Depression, Fighting Authoritarianism provides a new and important examination of U.S. youth activism of the 1930s, including the limits of the New Deal and how youth activists continually pushed FDR, Eleanor Roosevelt, and other New Dealers to do more to address economic distress, more inclusionary politics, and social inequality. In this study, author Britt Haas questions the interventionist versus isolationist paradigm in that young people sought to focus on both domestic and international affairs. Haas also explores the era not as a precursor to WWII, but as a moment of hope when the prospect of institutionalizing progress in freedom, equality, and democracy seemed possible. Fighting Authoritarianism corrects misconceptions about these young activists' vision for their country, heavily influenced by the American Dream they had been brought up to revere: they wanted a truly free, truly democratic, and truly equal society. That meant embracing radical ideologies, especially socialism and communism, which were widely discussed, debated, and promoted on New York City college campuses. They believed that in embracing these ideologies, they were not turning their backs on American values. Instead, they believed that such ideologies were the only way to make America live up to its promises. This study also outlines the careers of Molly Yard, Joseph Lash, and James Wechsler, how they retracted (and for Yard and Lash, reclaimed) their radical past, and how New York continued to hold a prominent platform in their careers. Lash and Wechsler both worked for the New York Post, the latter as editor until 1980. Examining the Depression decade from the perspective of young activists highlights the promise of America as young people understood it: a historic moment when anything seemed possible.